I got this Tele the other day and in setting it up for myself I was reminded how and why I hate setting the intonation with the Tele brass saddles. I know, it's a Tele and I'm not going to get it perfect with those type of saddles but that still doesn't keep me from pulling out what hair I have left. Kenneth Mountain, strat_strummer, fattboyzz and 1 other person like this. Get compensated ones, the best thing I ever did , there are tons of aftermarket compensated saddles slotted and not, although you can get very close if you tinker .... A LOT ..
Kenneth Mountain, LutherBurger, Las Palmas Norte and 1 other person like this. Can you explain what the issue is for those that are not familiar? Like what is easier vs the brass? I’m a bit of a Tele novice even though I built one partscaster Tele. It has brass barrels. I found this one I had laying around. Maybe toss it on the next time I change strings or something like that. I thought the brass was the real shizzle. Pat V., Kenneth Mountain and Dr Improbable like this. 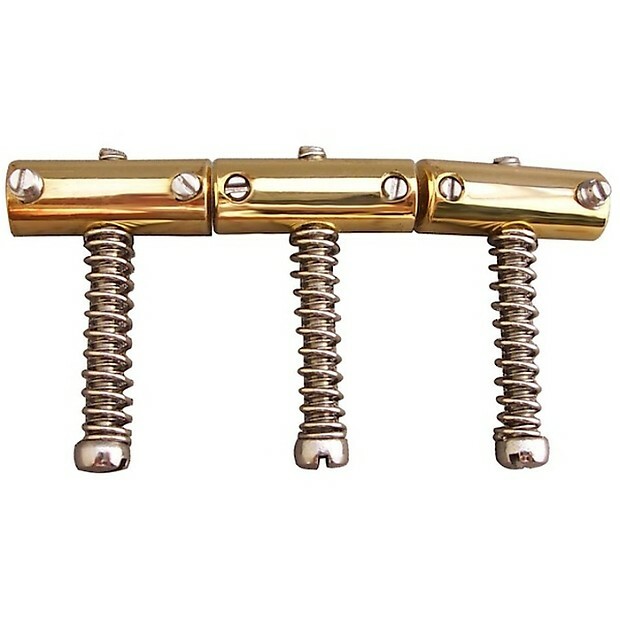 The stock traditional Tele saddles are brass barrels that are threaded to be perpendicular to the 3 intonation screws. Since each barrel does 2 strings, intonation of adjacent strings can be an issue, since normal intonation requires a double stair step arrangement of the saddles to be correct. Modern Tele bridges don't have this issue, they can be individually adjusted to be perfect. Pic at left. Note the stair steps, which repeats between the D and G strings. For keeping a more traditional look, intonated saddles have flats added to alter the string break point in order to take into account the different string lengths needed. five teles, Kenneth Mountain and ElRey67 like this. 3 barrel brass saddles can be challenging to intonate. I get pretty close, but it takes me a little while. Pat V., Kenneth Mountain, ElRey67 and 1 other person like this. I'm in the "Close enough" school of intonation. Pat V., squierplayer, Big tuna and 5 others like this. Pat V., Big tuna, Kenneth Mountain and 1 other person like this. Pat V., squierplayer, Dr Improbable and 1 other person like this. Of course, the three hard-to-intonate brass saddles are part of the classic tele sound, and were played in many a tune that is near and dear to a lot of us, I'll bet. squierplayer, Big tuna, Kenneth Mountain and 1 other person like this. Thanks for the education, guys. I get it now. My Tele build seemed to be properly intonated when I finished my set up. I let a friend borrow it (young kid who was learning guitar.....sob is probably a better player than me after a year). But when he returned it, it seems like I need to redo the setup. So when I get around to replacing the neck, I’ll keep in mind the issues discussed here. Here is mine. There are grooves for each string. Worshipcaster and Kenneth Mountain like this. squierplayer, Dr Improbable and Kenneth Mountain like this. For me, compensated saddles get "close enough" but I prefer 6-saddle bridges. I need all the help I can get to sound good. Dr Improbable, Kenneth Mountain, ElRey67 and 2 others like this. I just dont get it with Fender and their designs. They produce two of the most classic guitars i.e. Tele and Strat, they put in this stupid bridge system on the Tele that is almost impossible to intonate and they put in the most stupid tremolo system on their Strat with the six screws into the body which the system pivots on causing terrible tuning issues. Why didn't they modify both guitars early on with a six piece saddle on the Tele and a two bolts on the body pivot system on the Strat??? My question is: why do people complain about this on an electric . . . But find this perfectly fine on an acoustic . . . Even though that's less adjustable than this . . . Which is typically considered cheap and cheesy on an electric? From my perspective, these bridges and their design aren't crazy or stupid. A string can intonate correctly at only 2 points on the fretboard: 0 (open) and the 12th fret. The physics involved makes everything in between "off" by a few cents. A 6-saddle Tele bridge doesn't change that. The 3-saddle bridge compromises the intonation by a few cents over the entire fretboard, but only by a few cents. On a 21-fret 6-string neck there are 126 points where you can place a finger and play a note. People have learned to tolerate imperfect intonation for 95% of that fretboard, but get fixated on having perfect intonation at 12 specific points, the other 5%. It's all close enough for a tempered stringed instrument. I have 3 Teles with 3-saddle bridges that intonate close enough. 2 have standard barrel saddles and 1 has compensated saddles because I happened to have some. It intonates better at those 12 points, but the entire fretboard is close enough just like the 3-saddle Teles. Once in a while you find a Tele that just won't intonate close enough with a 3-saddle bridge, but that's usually due to bad bridge placement or a poorly cut nut with incorrect slot angles. The first thing I did to my James Burton Standard Telecaster was to replace the stock 6-saddle bridge with a 3-saddle bridge. Because of the string through design and string alignment along the neck, the intonation screws aren't on the center lines of the saddles and string tension shifts all strings in one direction, causing string misalignment on the neck. That, and contact between saddles that caused rattling, was enough for me. My 3 Strats include 2 with 6-screw bridges an one with a 2-post bridge. Set up properly, they have zero tuning issues. Everyone's mileage may vary, but I'm at a loss to know why. Worshipcaster, ElRey67, Big tuna and 1 other person like this.